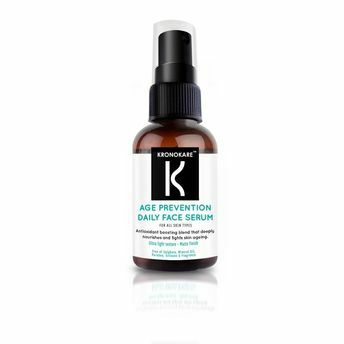 The Kronokare Age Prevention Face Serum is an ultra light serum that can be used as an alternative to cream moisturisers for all skin types. Rich in antioxidants and soothing ingredients, this daily-use serum provides moisturising benefits to dry, combination and sensitive skin types. It also perfectly suits those with an oily skin type, while offering them an invisible layer of hydration and matte finish. Formulated with efficacious Acai, Rice Bran and Passion Fruit Extract, and enhanced with Panthenol (Vitamin B5), and vitamin E, the Kronokare Age Prevention Serum is a complex blend of antioxidant ingredients that leaves the skin feeling hydrated, calmed, fortified and protected. Explore the entire range of Serums & Essence available on Nykaa. Shop more Kronokare products here.You can browse through the complete world of Kronokare Serums & Essence .